I loved creating this piece. The ‘construction’ of the cottage was the most enjoyable part of the process but I struggled a lot with the landscaping surrounding the building. 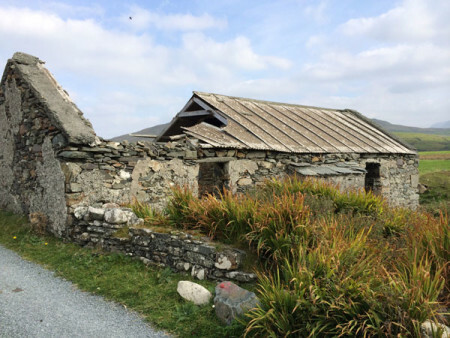 It works but is not what I really envisioned…..
Last September I had the chance to return to the west coast of Ireland and visit my ancestor’s cottage once more. I took countless photos and recently picked one for one more possible art quilt. This time I decided to deal with my foibles on those bushes up front. 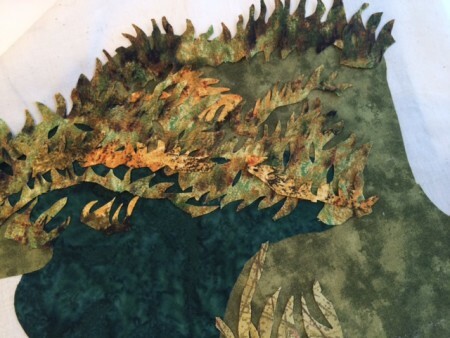 Before even cutting a full size muslin backing, I began experimenting with portraying those grasses. 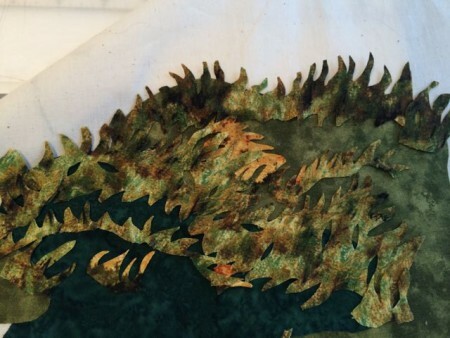 Beginning with some greens for a background, I began cutting shapes to lay over it. The approach held some promise so I continued to experiment. 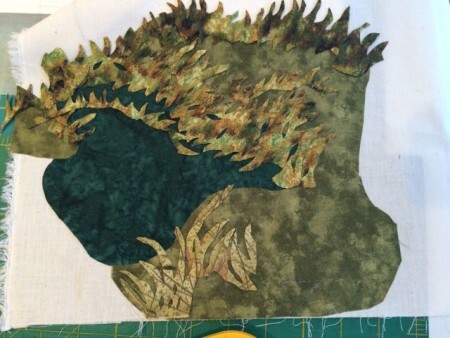 Slowly I have been adding to the complexity of the grasses. 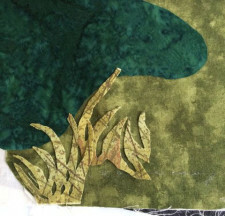 I still have a way to go in tweaking this technique, but you can see from the three photos below the potential of layering mixtures of fabrics cut in random patterns. Which brings me to last Sunday morning when someone on a morning talk program did a brief piece on a current show at the Museum of Modern Art in New York City. 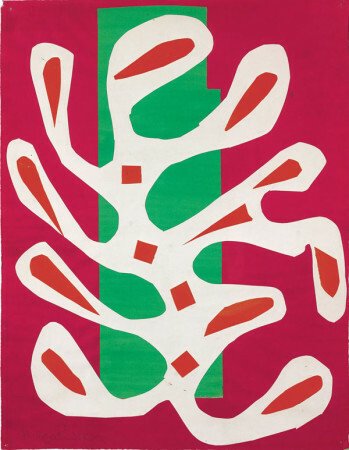 Entitled “Henri Matisee: The Cut-Outs”, it is a presentation of works by Matisse later in his life – all cut out from paper. Even before Matisse turned to creating solely in paper, he often used cut outs to arrange the composition of his paintings I had to smile. I felt a special kinship with this amazing artist. I have always admired his work…undoubtedly in studying it, without consciously realizing it, I was probably absorbing some of his approach. Here is just one example of his brilliance with cut paper that I found on the web from the Fondation Beyeler Museum. That Sunday morning program also mentioned a chapel in southern France that Matisse designed later in life and thought it was the crowning glory of his work. That sent me searching a bit on the web. The chapel is the Chapelle du Rosaire and it is pristine. You can find some photos here but, better yet, I found a video from the BBC Modern Masters series in 2010, in which Alastair Sooke visits the Chapelle du Rosaire. It is really worth watching. 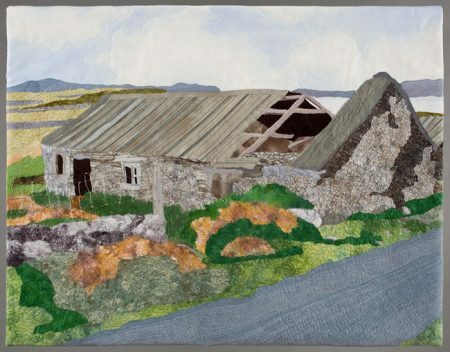 Judy, you are very good at cutting, which is not easy on these tiny pieces……the technique reminds me of Amanda Richardson’s exquisite collages….but I don’t think she quilts them after fusing (which eliminates the problem of the frayed edges I always get). I love your work and look forward to seeing this develop! Lucky you getting to visit the cottage more than once. Looks like your cutting is paying off. Not only do you have the shapes well done, but you’ve chosen a good layout of them and captured the right hues in the right places, too, in order to look like grasses waving in the wind and sun. Judy, I h ad the luck to visit this chapel when we lived in France. It was not our destination but found it by chance. It was beautiful. Love the way your vegetation is coming along.